In honor of Maryland making their second Super Regional in two years, I was inspired to look back at the greatest Terps baseball player of all time – Charlie Keller. “King Kong” Keller played for the Terps from 1935-1937 before joining the Yankees organization, and was part of what is usually considered a top 10 or even 5 outfield of all time, with Joe DiMaggio and Tommy Henrich. Keller was born in Middletown, MD, a suburb of Frederick, in 1916. He grew up on a farm until high school, when his family moved to town and he became a multi-sport star. He went to University of Maryland, and played several sports. He was on the football team, but stopped playing after hurting his ankle, not wanting to jeopardize his baseball career. At Maryland, Keller was spectacular, and he still holds the single season record for batting average, with .500, but perhaps even more impressive is the career batting average record, which also holds, at .497. He was signed by the Yankees but was allowed to return to Maryland to finish his degree. He spent another year in the minors before, in 1939, a 22 year old Keller debuted against the Washington Senators. He got his first hit a week later, also against Washington. Two days later he was in the starting lineup for an injured DiMaggio. He went back to the bench when the Yankee Clipper returned, but was back as a starter for good in August. For the season, he hit .334/.447/.500, with 11 HRs and a 156 OPS+. His OBP was the best for any rookie with more than 100 PAs that year, his AVG was second best and his SLG was third best. If the Rookie of the Year award existed back then… he probably would have come in a deserved second place thanks to some power hitter that came up that year. Keller got the last laugh, though, as he got to play in the World Series his rookie season. 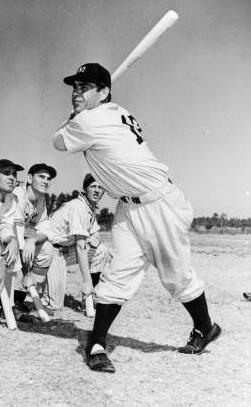 He did pretty well there – starting all 4 games in the third spot in the lineup, hitting ahead of Joe DiMaggio. He hit .438/.471/1.188 with 3 HRs, a double and a triple in 17 PAs. It’s not just the rankings, it’s who he was behind. For wRC+ he finished behind, in order, Williams, Musial, Mize, DiMaggio, and Greenberg. Same guys, slightly different order for wOBA. The only one who finished ahead of him in fWAR was Ted Williams, so needless to say, it’s pretty good company. Besides his rookie year, Keller would win two more rings before World War II. But after returning to play well in 1946, halfway through the season he went to the hospital for back pain, and it turned out he had a slipped disc. He didn’t play the rest of the season, including the World Series that year. He stayed with the Yankees for a few more years before being released, and tried a comeback with the Tigers, but he was never the same. Despite six more seasons of on and off struggles, he added little more than another full season’s worth of PAs to his resume, so his total numbers remain lofty. For his career, he hit .286/.410/.518. He ranks 33rd all time in career OBP, 41st in OPS, 31st in OPS+. He also ranks 27th in wRC+ and 20th in wOBA, but only 209th in fWAR, highlighting that despite being one of the best hitters ever, only having that title for 7 seasons isn’t enough to get you to the top of the value lists. When World War II came, he tried to enlist in every branch of service — Army, Navy, Air Force, Marines and Coast Guard — but was rejected. He could have played out the war in the major leagues, but was determined to help his country as best he could. The Merchant Marine finally accepted his enlistment despite his congenital back condition. Aboard ship, he drew the difficult North Atlantic run to Murmansk in the dead of winter, which wasn’t much fun. Upon his farewell day with the Yankees, he refused the new car they wanted to give him. Instead, he asked that if they insisted on an award, they create a scholarship at the University of Maryland in his honor for those who couldn’t afford tuition. One of the scholarship recipients was Jack Scarbath – Heisman Trophy runner up, College Football Hall of Famer, and QB of the Terps 1951 undefeated team who beat National Champion Tennessee in the Sugar Bowl (after the final vote). His old Yankees roommate Tommy Byrne believed he would have been a lock if healthy “If he wouldn’t have had the back problem, he’d have been one of the top five Yankees of all time, with Ruth, Gehrig, DiMaggio and Mantle.” But back problems, like another Yankee great, lessened the career of guy who looked like a shoe-in for the Hall of Fame. He probably wasn’t quite deserving of being in the Hall of Fame, but according to JAWS, he wouldn’t have been too much of a reach, and only a few LFers are ranked above him that didn’t make it. Obviously, he’s in both the University of Maryland Hall of Fame and the state’s hall. Keller moved back to the Frederick area, where he started a successful horse stable. He lived out the rest of his life running that farm, which bred champion horses and lasted just over 50 years, until 2006. If you want to read more about Keller, check out his detailed biography at sabr.org.